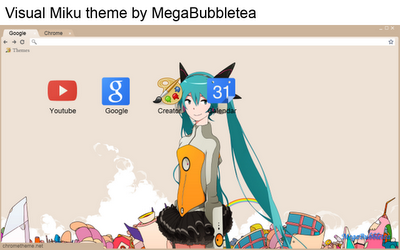 I'm glad to announce that another Chrome theme has been made by me for everyone to use! This time, with the request from pumkin_so77, I have made my first Miku theme! Check out the screenshots below as well as links to the Chrome Web Store. There are two versions since the background image wasn't really made to be scalable. Enjoy anyway! Google Play gift cards - they are real! It seems like Google has finally listened to the community and have decided to launch a gift card service for their Play Store. The cards come in $10 and $25 gift cards, clearly branded for Google Play, with "Music Movies Books Apps & More" listed at the bottom. It'll be interesting to see how they get positioned at retail alongside the likes of iTunes and Barnes & Noble and tons of other other gift cards, but this much is certain -- that triangular logo we were never too sure about should stand out pretty well. Also unknown is where, exactly, the cards will be available. Right now, it seems that it will only be available in the U.S. According to Android Central, that means individual stores such as Best Buy, Target and/or Wallmart? Developers hate seeing U.S.-only launches and most people would agree. In short, gift cards are coming, and it looks like they're coming sooner rather than later. ONE OK ROCK releases PV for "The Beginning"
On Tuesday, JRock band ONE OK ROCK released the full official PV on their YouTube channel for the new single "The Beginning". This single is the theme song for the movie Ruroushin Kenshin.